Last week at Bennett's CF Clinic, Bennett's CF Doctor asked us how we were doing with his treatments. I thought about lying. But I decided that lying wouldn't help anyone. The doctor isn't my mother or my teacher. She is there to help us. So, I told her, "we're not doing so well. we're not getting in his CPT but once a day and his nebulizer less than that." I explained that it isn't that we are lazy or unwilling. It's just that there aren't enough hours in the day due to Bennett's feeding pump, vomiting issues, naps, doctor appointments, splitting enzymes, other daily medications, keeping up with a toddler, running a house, etc. We are doing our best to do what we are doing as it is! 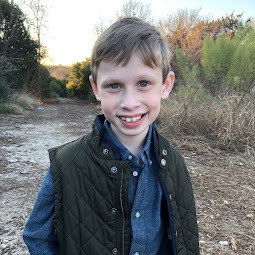 The doctor, who sat down to talk to me about this issue, said, "Well, you know that having a child with CF is not like having a healthy child. This is a very long road." I responded, "yes, I know...and it is our working goal to do his treatments as ordered daily. But I'm being honest, at this point, it's just not happening. I'm struggling to balance it all." I went on to list all of the things we are focusing on *just* with Bennett right now, not to mention that we're trying to keep our life as normal as possible for our other child and our own sanity. The doctor tried to encourage me, "Well, it will get easier. Bennett will get older and you will get better at handling all of this." But I knew that what she was saying wasn't necessarily true. I read alot. I talk to other CF moms. Maybe I will become more efficient with my time. Maybe Bennett will be able to walk on his own and swallow his own enzymes at some point. But overall, CF doesn't get easier. Typically, CF only gets harder. "Dr. Dambro," I replied, "you know that isn't necessarily true. If Bennett's throat culture from today comes back showing he is culturing psuedomonas or MRSA, our life just got more complicated in an instant. Bennett will be placed on new time-consuming medications and runs the risk of more hospitalizations. And even if Bennett's labs come back clean from today...there will be a day when they come back showing he's culturing something and our life will have just gotten harder." Bennett's doctor knew I was right. Her face began to melt. She responded, "Well, you know, most parents who have a baby with CF are typically only dealing with giving enzymes and doing CPT at this point. Most parents have a sort of 'break' before their child's CF care becomes really time intensive. But for you, it started from the day he was born. So, yeah, you didn't get that break most parents get." Possibly we did miss out on any sort of "honeymoon" period that some (but not all) CF families get. Bennett was born very very sick, rushed to the NICU immediately, taken into surgery at less than 24 hours old. His multiple surgeries, ileostomy, eating exclusively through a feeding pump, etc. are not necessarily typical for many babies with CF. Bennett is of the 1% of Cystic Fibrosis babies born with a perforated colon caused by Meconium Ileus. So, it's no wonder when I heard her validate that our life with Bennett is no cake-walk, it felt good. 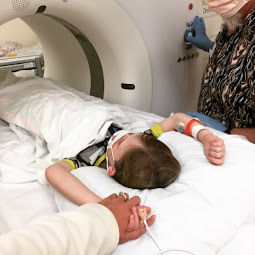 It felt validating to hear our doctor admit that our situation isn't necessarily "typical" of CF families in our stage of the illness. 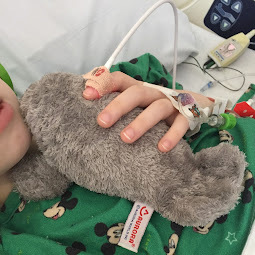 We don't like hearing that Bennett's GI complications seem to be showing more severe at this point...but it felt good to be validated that our struggle is, in fact, a struggle...and not one that is supposed to be this way. 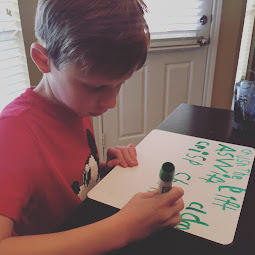 In the midst of hearing so many wonderful stories of CF children who thrive and families who almost forget their children have CF (there are many many stories like this), we have felt that this has not been our story. We are barely keeping our heads above water. We have felt CF has taken much more of our son and much more of our life these 10 months than we had expected and even had heard from doctors/other CFers that it would. Bennett's CF has been complicated so far. Hopefully things will even out. But until they do (and realistically they may not) we have to learn how to embrace the life God has given Bennett and us to live. ...And this is the story of how we got the Vest. It was during this conversation when the doctor agreed to give us an opportunity to make life easier. So much of the time, we are at the mercy of CF. But choosing to get the Vest was like finally gaining some control over CF. The Vest allows us to make life more manageable, at a time when we need to manage more with less. I loved hearing Bennett's doctor respond non-chalantly to my request for The Vest with "You can have it now. I don't care." It was fabulous to feel like she was on board - anything to help us care for him better - anything to help Bennett's life become more normal. Now that we've had the Vest for almost a week, we are loving it!! Bennett is handling it well and we are getting his treatments done every day. Although, Bennett does sometimes try to get up and crawl with the vest on (it doesn't work), he is mainly happy to sit during the 20 minute treatment. Life is full of difficulties. And maybe Life With CF forces one to face those difficulties more head-on. But it's not the struggle that defines someone, it's how they handle it that matters. We are working really hard to handle Bennett's situation well - trying not to merely cope but to succeed. It's not easy, that is for sure. Playing "Wack-a-Mole" with CF is exhausting. But we are thankful for the people in our lives who provide us with encouragement, the technology at our fingertips that provides us with information and the opportunities we have been given which provide us with a way to manage life. It is these things that help us accept our difficulties and thrive. Thank you God for all your blessings, even small blessings such as The Vest! I'm glad you got this great vest! How wonderful that there are people out there finding new ways to make life just a little easier for Bennett. I read your encouraging comment on my previous post and I would loove for you to come and bring lunch! It would be great to chat with you since we won't be able to meet during the day anymore if I get the full time job! Hang in there friend. I know this all must be so hard for you. But, if anyone can handle it, you can. You are truly amazing and you can do anything with God's help. Praying for you and for Bennett! Now, hurry up and tell us why you almost didn't post this!! !